The Bishop Museum of Science and Nature > Blog > Manatee Rehabilitation > Welcome ONeil and Tannebaum & Welcome Back Baca! 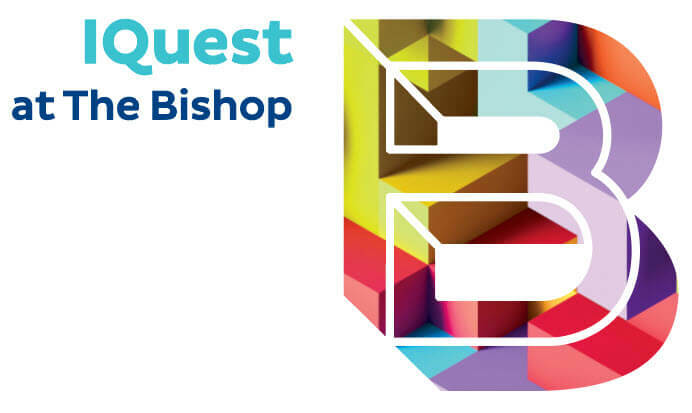 On Tuesday, March 27, the At The Bishop welcomed two new patients to its Stage 2 Manatee Rehabilitation Aquarium: ONeil and Tannebaum. And on Wednesday, March 28, they were joined by Baca who returned to the Museum after a month at SeaWorld. Wednesday was also Manatee Appreciation Day — a special day to celebrate these very special animals. The Aquarium is also open to the public again, following the completion of scheduled maintenance, including buffing and re-sealing the 60,000-gallon habitat’s windows, deck work, fiberglass work and painting. 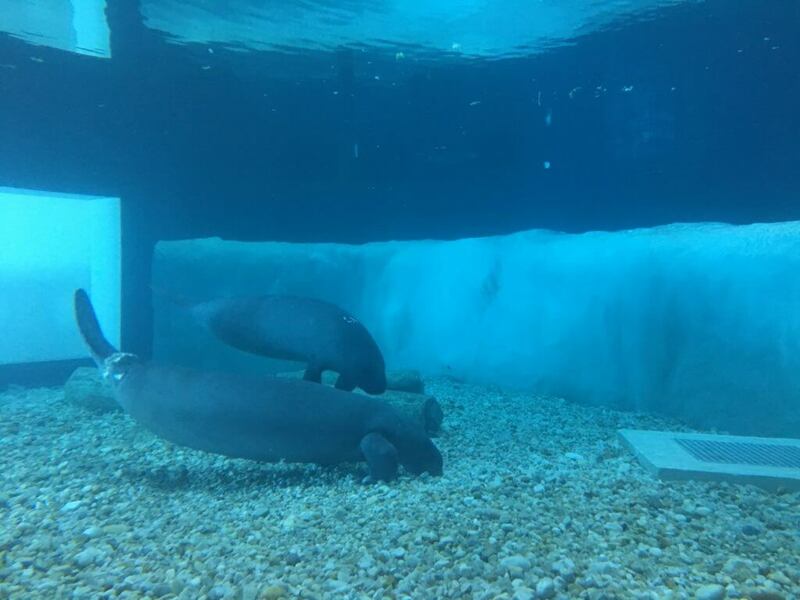 “We completed the maintenance work right on schedule and now — with the window newly buffed and sealed — underwater views of the manatees are better than ever,” said Virginia Edmonds, the Museum’s Aquarium Director. 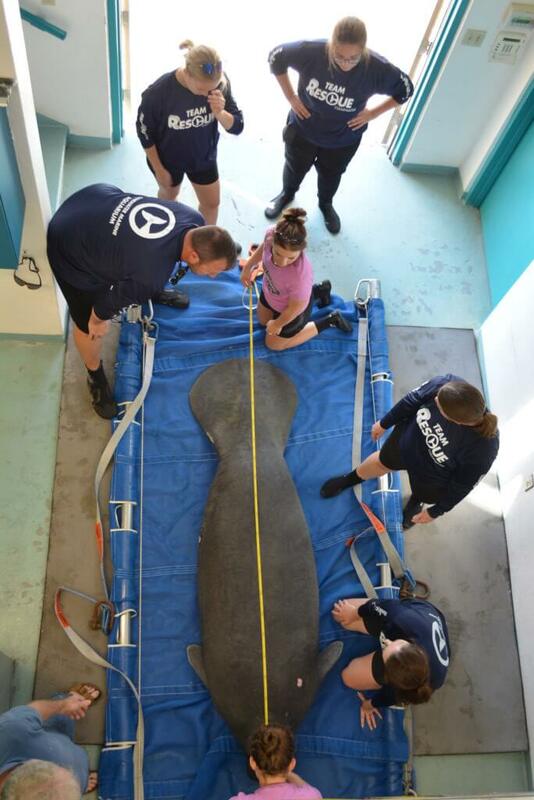 As a Stage 2 facility, the Museum is the place where manatees come after their critical care needs have been taken care of. 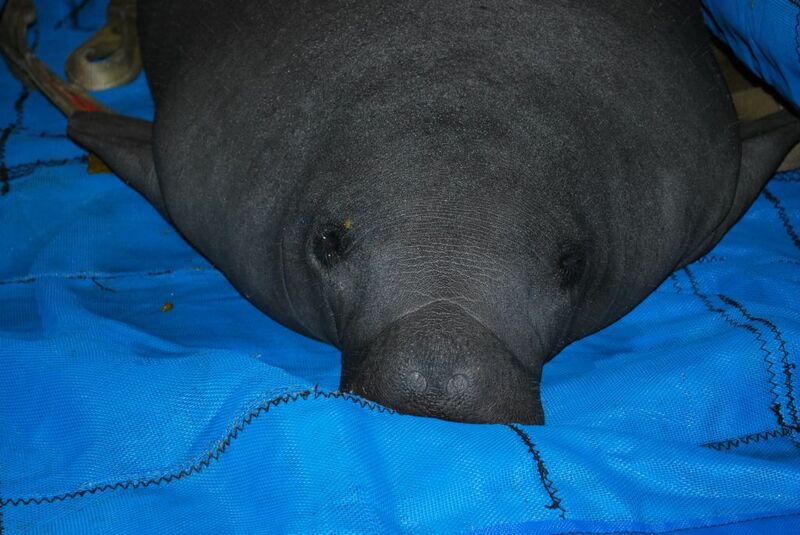 Its main tasks are bringing rehab manatees up to the right size and weight for release and, if injured, allowing them to finish the healing process. Typically, these animals remain in the Museum’s care anywhere from a few months to more than a year, depending on the amount of time they need to reach the appropriate size. • Tannebaum is a young adult male that was rescued in January near the mouth of the Caloosahatchee River in Fort Myers after an entanglement that lasted several days and caused an injury that nearly severed his tail. He is 730 pounds and just over 8 feet long. A closeup of Tannebaum. Photo copyright South Florida Museum. • ONeil was just a 30-pound orphan when he was rescued from Florida’s east coast near Merritt Island in Brevard County in July 2015. After being raised at SeaWorld, he is now much closer to the size he needs to be at release, but still has bit more to grow. 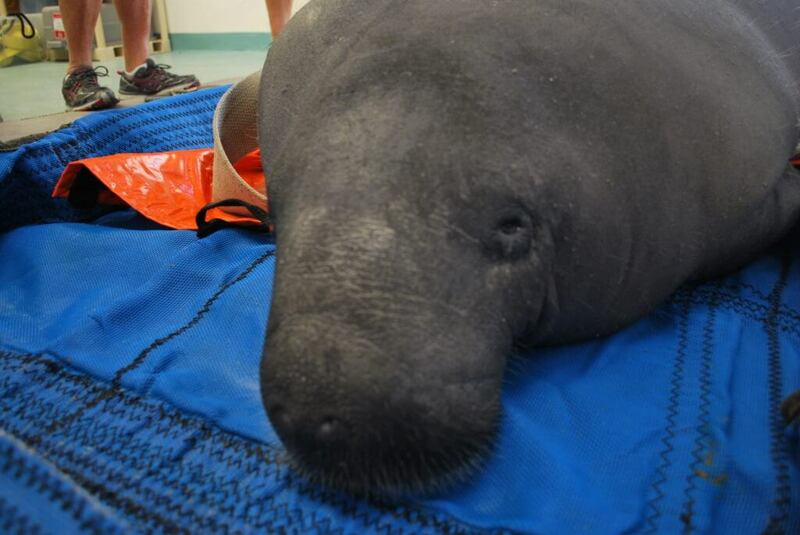 “Manatees are typically about 60 pounds when they’re born so he was unusually small,” Edmonds said. “Perhaps he was premature. He was also having buoyancy issues so there were some problems with his lungs as well.” Today, ONeil is 565 pounds and a little over 7.5 feet long. A closeup of ONeil. Photo copyright South Florida Museum. • Baca, a young male calf, was rescued from the Banana River in Cocoa Beach in 2017 suffering from cold stress. Baca originally came to the Museum in the summer of 2017, but temporarily moved to SeaWorld in February so that the maintenance work on the Aquarium could be completed. He weighs 511 pounds and is just over 7.6 feet long. Baca is measured after arrival at the Museum. Photo copyright South Florida Museum. Tannebaum and ONeil mark the 34th and 35th manatees that have been treated at the At The Bishop during its successful 20-year history rehabilitating manatees so they can be returned to the wild. 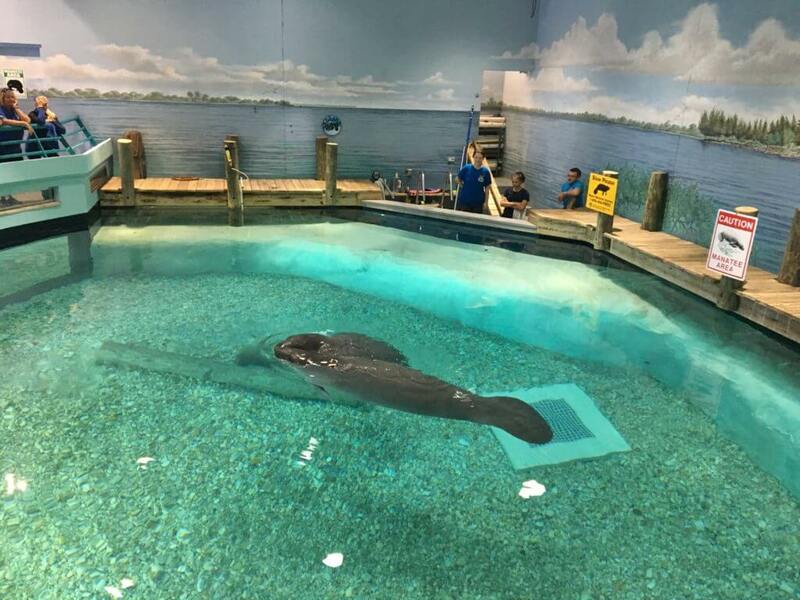 The Museum conducts rehab work as part of the Manatee Rescue and Rehabilitation Partnership, a self-governing group originally created by the U.S. Fish and Wildlife Service that is today is made up of organizations that participate in manatee rescue and rehabilitation. 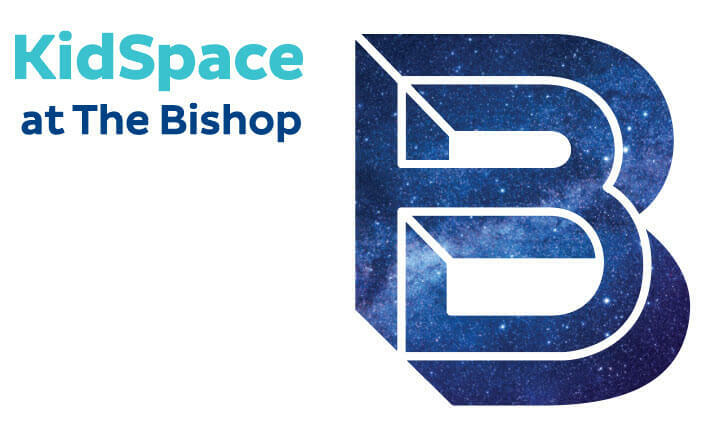 The Museum was a founding member of the Partnership, which began in 1998. 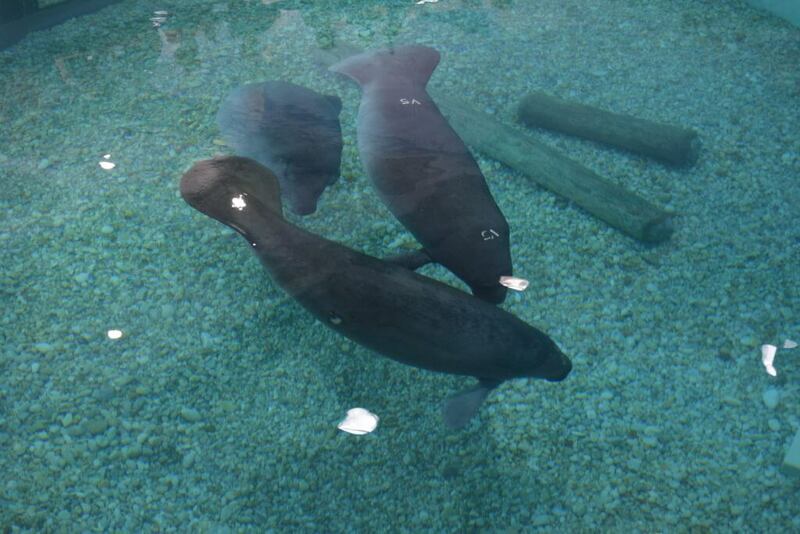 This photo shows Baca, bottom, being greeted by Tannebaum (center) and ONeil (right) as he arrived in the manatee habitat. Photo copyright South Florida Museum. This underwater picture of Tannebaum and ONeil shows the healing wound on Tannebaum’s peduncle — the place where his tail meets his body — that was caused from a line entanglement. Photo copyright South Florida Museum. This topside image shows ONeil in the foreground with Tannebaum. The marking on his back is a freezebrand, which will help rescuers monitor his progress when he eventually returns to the wild. He was rescued at a very young age and was smaller than typical manatee newborns, so keeping track of his return to the wild will be very important. Photo copyright South Florida Museum.